This article is about the city in Orange County. For the town in Delaware County, see Middletown, Delaware County, New York. Middletown is a city in Orange County, New York, United States. It lies in New York's Hudson Valley region, near the Wallkill River and the foothills of the Shawangunk Mountains. 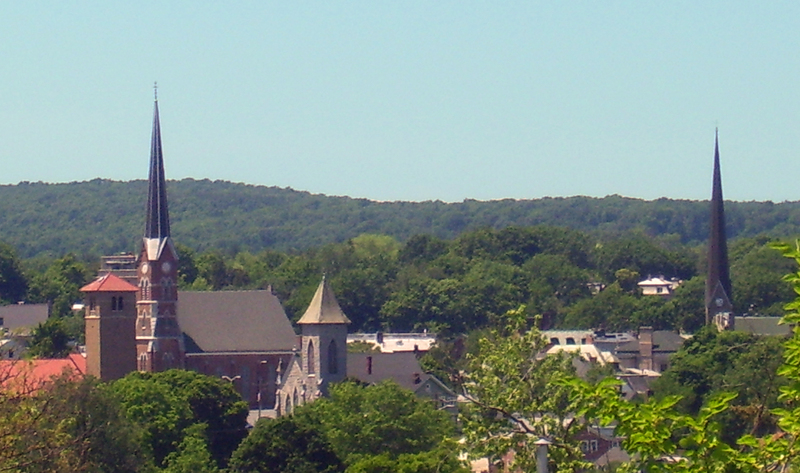 Middletown is situated between Port Jervis and Newburgh, New York. The city's population was 25,388 at the 2000 census and 28,086 as of the 2010 census. The zip code is 10940. Middletown is a principal city of the Poughkeepsie–Newburgh–Middletown, NY Metropolitan Statistical Area (MSA), which includes all of Dutchess and Orange counties. The two-county MSA had a population of 621,517 at the 2000 census. A July 1, 2007 estimate placed the population at 669,915. The city also lies along the northern boundary of the New York metropolitan area. John Green purchased land from the DeLancey patent and probably settled the area around 1744. Due to its location between other pre-existing locations, the name of Middletown was adopted, but later changed to South Middletown to avoid confusion with another nearby location. Eventually the word "south" was dropped, giving the current name when the community became a village in 1848. The village was incorporated as a city in 1888. The First Congregational Church of Middletown, established in 1785, has the highest spire downtown. It can be argued that the construction of the church marks the beginning of Middletown's existence as a village. The current building was constructed in 1872. Middletown grew up with the Erie Railroad and the New York, Ontario and Western Railway (among others) and attracted a number of employers, such as shoe, lawnmower blade, and furniture factories, but most of these businesses had closed by the 1960s. The closing of a large Ford Motor Company plant in Mahwah, New Jersey, and the downsizing of IBM operations in the area were a blow to the economy of Middletown and surrounding communities in the 1970s. Beginning in the 1970s, New York City police officers, firefighters and other workers moved to the area to purchase houses that were much less expensive than those nearer the city. These long-distance commuters helped to bolster the economy of the area. After 1986, however, when New York City required its municipal employees to be resident in the city, Middletown lost this source of growth. The only railroad left in town is the Middletown and New Jersey Railway, a freight line. The downtown business district of Middletown suffered from the growth of the "Miracle Mile" shopping strip and Lloyd's Supermarket in the late 1960s and later two shopping malls, all located at the eastern edge of town along Route 211, near Route 17 and Interstate 84. The Orange Plaza mall drew several of the downtown shops into it by the mid-1970s, and to the East across Route 17, the Galleria at Crystal Run opened in the early 1990s. A Super-WalMart replaced the Orange Plaza mall in 2001. Some of the buildings downtown are abandoned or underutilized, although there has long been an active downtown bar and restaurant scene. The downtown area has a number of historic churches, and Highland Avenue has a number of large Victorian houses. Some of the largest Victorians are now used as nursing homes. The Middletown City Hall and City Court are located on James Street. There are some prosperous neighborhoods, such as Presidential Heights, but there are many less prosperous neighborhoods. The surrounding countryside was devoted partly to small dairy farms, but this has waned since the 1980s. Middletown is the main business address for Mediacom Communications Corp and its related entities, a cable and other pay TV company. Their headquarters building is located outside the city in the Town of Wallkill. Shopping in the area includes the Galleria at Crystal Run, a mall just east of Middletown, and a long retail strip along Route 211 on the east side of town. The downtown area, particularly North Street and East/West Main Street, has a variety of ethnic eateries and various small shops. A children's science museum, called The Interactive Museum, and a number of churches are located in the neighborhood. The city also has movie theaters, the historic Paramount Theatre, a local arts council, bowling alleys, WALL and WOSR radio stations and Thrall Library downtown. There are also active Boy Scouts of America and Girl Scouts of the USA chapters, as well as Lions Club, Elks Club, Kiwanis, Rotary Club and other service clubs. The Rotary Club runs an annual Horse Show at Fancher Davidge Park each fall. Middletown is also the site of the Orange County Fair each summer and the Orange County Fair Speedway. SUNY Orange, previously known as Orange County Community College, is located in Middletown (and includes the historic Webb Horton House (pictured), more commonly known as Morrison Hall). Orange Regional Medical Center, a hospital completed in 2011, merging the faculties of the former Horton Medical Center and Arden Hill Hospital, located at 707 East Main Street in the Town of Wallkill, is a major employer. The local newspaper is called the Times Herald-Record, the first cold press offset daily in the country. Middletown is the site of works of two prominent architects: Hillside Cemetery, designed by prominent British architect and landscape designer Calvert Vaux, who also designed New York City's Central Park with Frederick Law Olmsted; and J. W. Chorley Elementary School, designed by American architect Paul Rudolph, while serving as Dean of the Yale School of Architecture. The Highland Lakes State Park is the nearest State Park, and good choices for hiking, biking, and country drives are nearby. Middletown is located at 41°27′N 74°25′W﻿ / ﻿41.45, -74.417 (41.4458, -74.4221) in eastern Orange County. The city is nearly surrounded by the Town of Wallkill, except for its southernmost section, which is in the Town of Wawayanda. According to the United States Census Bureau, the city has a total area of 5.2 square miles (13.3 km²). 5.1 square miles (13.3 km²) of it is land and 0.19% is water. The city is drained by Monhagen Brook and the Wallkill River. Middletown can be reached from New York City by bus and is located near the intersection of Interstate 84 and NY 17 (the future Interstate 86). State routes 17M and 211 run right through the city, and US 6 parallels I-84 to the south. The Middletown-Town of Wallkill station on Metro-North Railroad's Port Jervis line is located nearby, in the Town of Wallkill, and provides rail service to Port Jervis, other communities in Orange and Rockland Counties and Bergen County, New Jersey, Hoboken and New York City via a transfer at Secaucus, New Jersey. The city of Middletown also offers a bus service, consisting of approximately a half-dozen routes throughout the city and the Route 211 commercial strip. A downtown transportation center is also planned as a central location for all local bus services. There is also a "Main Line" bus connecting to surrounding Orange County villages., and another route connecting to villages such as Newburgh & Woodbury. As of the 2010 census, the population of Middletown is 28,086. The racial makeup is 39.7% Hispanic, 36.6% white, 21.0% African-American, 1.9% Asian, and 0.8% Native American. As of the census of 2000, there were 25,388 people, 9,466 households, and 5,963 families residing in the city. The population density was 4,939.5 inhabitants per square mile (1,907.1/km²). There were 10,124 housing units at an average density of 1,969.7 per square mile (760.5/km²). The racial makeup of the city was 68.68% White, 15.13% African American, 0.75% Native American, 1.69% Asian, 0.03% Pacific Islander, 9.33% from other races, and 4.40% from two or more races. Hispanic or Latino of any race were 25.11% of the population. 34.0% of households had children under the age of 18 living with them, 40.0% were married couples living together, 16.7% had a female householder with no husband present, and 37.0% were non-families. 30.0% of all households were made up of individuals and 12.3% had someone living alone who was 65 years of age or older. The average household size was 2.62 and the average family size was 3.27. In the 2000 census, the city's population was spread out with 27.8% under the age of 18, 9.4% from 18 to 24, 31.0% from 25 to 44, 19.9% from 45 to 64, and 12.0% who were 65 years of age or older. The median age was 33 years. For every 100 females there were 93.4 males. For every 100 females age 18 and over, there were 90.1 males. The median income for a household in the city was $39,570, and the median income for a family was $47,760. Males had a median income of $35,990 versus $28,429 for females. The per capita income for the city was $18,947. About 13.5% of families and 17.5% of the population were below the poverty line, including 25.4% of those under age 18 and 10.3% of those age 65 or over. Middletown is governed by a mayor and a city council known as the common council. It consists of 9 members, an alderman-at-large, who acts as president of the council, and eight members elected from wards. Each of the city's four wards elects two members. The mayor and the president of the common council are elected in a citywide vote for four-year terms. The other council members have two-year terms. Terms of office begin on January 1. A fire chief and three assistants are elected every three years by members of the city's engine companies. A corporation counsel, commissioners of public works and of assessment and taxation, a city clerk, registrar and a treasurer and any other officers required are appointed annually by the mayor and confirmed by the common council. In the past 10 years, the Middletown public school system has shifted from maintaining numerous small neighborhood schools and combined more students into fewer magnet schools. Four elementary schools cover varying grade levels from kindergarten through fifth grade. Truman Moon Elementary houses kindergarten and first grade. John W. Chorley Elementary houses kindergarten through second grades. Mechanicstown Elementary and Maple Hill Elementary house grades two through five. In 2005, the Middletown School District implemented a full day kindergarten program at the request of the Middletown voters. Two middle schools in the district, Twin Towers Middle School and Monhagen Middle School collect the students from the elementary schools. Middletown High School is the only building for high school and includes grades nine through twelve. There is also a Catholic elementary school. Middletown High School offers many programs in addition to the basic educational classes found in most schools. The Middletown High School has a large and active sports program including football, baseball, basketball, tennis, swimming, track and field, soccer, lacrosse, and various other athletic programs, as well as various other after school academic and social programs and activities. The High School also offers a Naval Junior Reserve Officer Training Corps program. SUNY Orange, previously known as Orange County Community College, is located in Middletown. Crystal Run – A hamlet east of Middletown, near Interstate 84 at County Road 83. Fair Oaks – A hamlet north of Middletown on NY Route 17M. Howells – A hamlet northwest of Middletown. Mechanicstown – A hamlet bordering Middletown to its southeast. Michigan Corners – A hamlet east of Middletown on Route 211. Phillipsburg – A hamlet southeast of Middletown on the Wallkill River and Route 17M. Pilgrim Corners – A hamlet bordering Middletown to its west on Route 211. Rockville – A hamlet north of Middletown. Scotchtown – A hamlet northeast of Middletown, just across Route 17 on Route 101. Van Burenville – A village to the north of Middletown near Mount Hope. Town of Wallkill, the township that nearly surrounds Middletown, most of which is located to the north and east of Middletown. Washington Heights – A hamlet bordering Middletown to its north. ^ "Annual Estimates of the Population of Metropolitan and Micropolitan Statistical Areas: April 1, 2000 to July 1, 2007 (CBSA-EST2007-01)" (CSV). 2007 Population Estimates. United States Census Bureau, Population Division. 2008-03-27. http://www.census.gov/popest/metro/tables/2007/CBSA-EST2007-01.csv. Retrieved 2009-01-17. ^ Yashinac, Rob (September 2006). "Ontario & Western Railway Station". Hudson Valley Ruins. http://www.hudsonvalleyruins.org/yasinsac/orange/OandW.html. Retrieved 2013-05-10. ^ Retail businesses in Middletown are often referenced in the phone calls of The Jerky Boys, including the Route 211 Taco Bell in "Civil War Memorabilia (Part 2)", from The Jerky Boys 3, and the Middletown Motel and International Golf Discount in "What's Wrong With This World" from 2000's The Jerky Tapes. (New York) Ontario & Western Railway Historical Society, Inc. This page uses content from the English language Wikipedia. The original content was at Middletown, Orange County, New York. The list of authors can be seen in the page history. As with this Familypedia wiki, the content of Wikipedia is available under the Creative Commons License.